France's "yellow vest" protests against fuel prices weren't organized by the Left. But the fight to widen their demands is key to blocking the growth of Marine Le Pen's far right. The last two weekends have seen mass mobilizations across France by the “gilets jaunes” protesting against the increase in fuel prices. On Saturday, November 17, 282,000 of these “yellow vests” (so named after their distinctive high-visibility vests, which all motorists have to carry by law) mobilized around the country, mounting roadblocks of road intersections and roundabouts, “snail operations” to slow traffic, and actions to defy tolls. There were more than two thousand actions across the country, almost four hundred arrests, several hundred injured, and one dead. That day saw clashes with the police, and the movement continued over subsequent days without respite, despite repression. On November 24, according to the Interior Ministry estimate, 106,000 people took part in the protests, including the eight hundred who made it to Paris for the self-proclaimed “Act II” of the movement. While the police prefecture banned protesters from approaching the Élysée (the presidential palace) in fact demonstrators did take over the central Avenue des Champs Elysées, sparking violent clashes with police that continued throughout the day. Some gilets jaunes have already announced their intention to return to Paris next Saturday. But also notable is the media coverage of these protests: indeed, no other recent social movement in France has had similar visibility. For ten days, the whole French press has been busy figuring out who these unlikely protesters actually are. Many of them tell journalists that they have never previously demonstrated: it proclaims itself an apolitical citizens’ movement, and indeed, emerged outside of the political and trade-union frameworks that usually dominate large mobilizations. This is, indeed, a composite, embryonic movement with many faces: men and women, employees, precarious workers, those on unemployment benefits, the economically inactive, retirees, teachers, businessmen, and workers. Some party members and trade unionists are there, too, mixed in among the mass. They come from both right and left. But they do have one point in common: this is the France that struggles to make it to the end of the month. Simply put, a movement of the people. But not all of them. The people who are mobilizing in the gilets jaunes movement are the people of peripheral France: those who come not from large urban centers but from smaller towns and rural areas. A part of the country that is not usually seen is today rising up. To make itself visible it wears the flourescent yellow vest, a reflective garment every driver has to keep in their car. They came together, and organized, on social media — a few weeks ago groups started being created for each département (small administrative units of France) — and sometimes they held a few preparatory meetings before they took to the streets on dawn of Saturday 17. The gilets jaunes came together to protest against the increase in fuel prices. And with good reason: this year the price of diesel has increased by 23 percent and petrol by 14 percent due to the jump in the price of a barrel of oil. In addition, the government has recently announced that diesel and petrol prices will increase further — by four and seven cents a liter respectively — presenting this as a means of financing an ecologically oriented energy transition. ‘Macron, resign!’ is a slogan that thunders through the provinces and along the Champs Elysées. This announcement has, unsurprisingly, caused great discontent among the lower and middle classes, especially those of peripheral France most affected by transport costs. For these citizens, who travel many miles every day by car, fuel prices can seriously cut into their incomes. The voices heard in recent days express a clear feeling of exasperation, the sense of being the objects of the contempt of (and exclusion by) a political class which they generally reject. Many call for the government and President Emmanuel Macron to resign. They continually insist on his low support and weak electoral legitimacy: after all, in last year’s presidential contest he only scored 24 percent in the first round, and turnout in the runoff hit historic low. “Macron, resign!” is a slogan that thunders through the provinces and along the Champs Elysées. This feeling of exasperation is the result of years of fiscal and social policies that have gradually strangled the low and middle classes, including in terms of the tax take. Immediately upon reaching office, Macron abolished the Solidarity Wealth Tax (ISF), giving €4 billion to the richest; and has strengthened the Tax Credit for Solidarity and Employment (CICE), a tax cut and exemption program transferring €41 billion a year to French companies, including multinationals. Shortly afterwards, with the 2018 budget bill, Macron established a flat tax that allowed a lowering of taxation on capital, handing another €10 billion to the richest. At the same time, the government has increased the General Social Contribution (CSG) income tax to be paid by pensioners, while pensions themselves have ceased to be indexed to inflation (and thus to retirees’ ability to buy consumer goods). It has got rid of the subsidized contracts (which allowed large numbers to work on contracts partly financed by public bodies) and lowered by five euros a month the amount of housing contributions (APL) for the most disadvantaged. As if that were not enough, the new “carbon tax” will weigh five times heavier on the budgets of the middle classes than on that of the upper classes. Yet the government has taken no steps to counterbalance this obviously unequal treatment — for example by giving aid to the families on the most modest budgets. This has exacerbated a divide between the people and the privileged elite represented by the president, aggravated by a series of recent financial scandals enveloping recent heads of state. If governments have continued to repeat that tax breaks for the richest and big companies would stimulate investment, the figures tell us otherwise: we are still waiting for the million jobs promised by Hollande and his then-adviser Macron when CICE was launched in 2012. The movement is not limited to mainland France, but has also reached France’s “ex”-colonies in the overseas territories and in particular the island of Réunion. In a territory where unemployment is sky-high and 42 percent of people live under the poverty line, the prices of petrol, gas, and electricity have also continued to increase. As in rural and peripheral France, such territories have particularly suffered the degradation of public services over the last decade or more, as governments close the hospitals, courts, and train stations taxes are meant to pay for. The social contract crumbles, and gives way to anger. In Réunion, in fact, the movement has assumed particularly impressive proportions, with clashes with police, the torching of cars and “self-discounts” (collective shoplifting) all leading to the introduction, Tuesday last week, of a curfew imposed by the island’s police prefect. Indeed, while the regional council announced on November 21 that it would freeze fuel prices for the next three years, the tensions have not abated and the gilets jaunes now demand a cut in petrol costs. The movement’s demands have also spread to include the cost of living, access to jobs, measures to tackle inequality, and a broader demand for respect. On November 26 the gilets jaunes across France named eight “national communicators” on Facebook, responsible for dialogue with the government. While some in the movement question how representative they are, these spokespersons have requested a meeting with the government to carry forth the movement’s demands. The main proposals formulated thus far are a general decrease in taxation and the creation of a “citizen’s assembly” to discuss the ecological transition, respect for citizens’ voices, the increase in purchasing power, and renewed value being attributed to labor. The assembly would also discuss such diverse measures as a ban on glyphosphate, the marketing of biofuels, the abolition of the senate, the organization of frequent local and national-level referenda, the increase in subsidies for the creation of jobs (and not precarious ones), respect for gender parity and equal treatment, an increase in the minimum wage, and the cutting of employers’ social contributions. Yesterday, the gilets jaunes issued a press release including about forty “peoples’ directives,” sent also to MPs. These included measures such as the complete resolution of homelessness, a more strongly progressive tax system, a universal social security system, MPs on the average salary, forbidding outsourcing and posted work, creating more open-ended contracts, abolition of the CICE, investment in sustainable transport, the end of austerity policies, the introduction of a maximum salary (at €15,000 a month), rent controls, and an immediate end to the closing of rail lines, post offices, schools and nurseries, and so on. All this seems like a challenge to the policies of the “anti–Robin Hood” president who robs from the poor and gives to the rich. Countless placards call for Macron’s resignation, and indeed this movement follows after many others which began even before November 17, from the fight against university reform and public-sector cuts to the battle against the repression conducted in the name of “fighting terrorism.” Yet it remains to be seen whether the much-sought-after “convergence of the struggles” will finally come true. The gilets jaunes are looked at with a good deal of confusion, suspicion, and mistrust — not only by a condescending media, but also across large swathes of the comments coming from the varied world of the Left. Criticisms of their behavior have been influenced by an evident contempt for the “lower classes”: social media are awash with jokes about the “pig-headed” “imbeciles” of the “France d’en bas.” Such derision also appeared across the social networks close to the autonomous “movement” left, before the powerful demonstration of November 17. Some doubts are legitimate. Ecologists and the defenders of nature have been, to say the least, disconcerted by the hubbub around a movement that basically asks to be able to burn more fuel at a lower price and that seemed initially uninterested in the government’s at least explicit intention to use this “carbon tax” to fund the ecological transition. This is one of the main reasons why the unions and leftist forces initially did not support the movement. Faced with the extent of the mobilization, however, many have reconsidered their positioning; indeed, all the forces of the opposition from left to right (with the exception of the Greens) have discreetly expressed their support for the movement, while also being careful not to be accused of opportunistically “recuperating” it for their own political ends. The social contract crumbles, and gives way to anger. Jean-Luc Mélenchon, writer and MP François Ruffin, and other figures from France Insoumise — as well as many of its grassroots militants — took part in the mobilizations alongside the gilets jaunes. On Tuesday November 20 the moderate trade union FO Transports voiced its backing. Even Philippe Martinez, the general secretary of the main French trade union, the initially skeptical CGT, has finally expressed his cautious support and called for a joint demonstration on December 1. Support has also begun to arrive from the left of the movements. For instance, the Vérité pour Adama committee — which fights for justice and truth on the death of Adama Traoré, a twenty-four-year-old killed in a police station in July 2016 in Beaumont-sur-Oise, a poor district in the Parisian suburbs — has announced that it will join the gilets jaunes in the streets next Saturday. Most of the “big names” of the activist and intellectual French left – such as Assa Traoré, Frédéric Lordon, and Edouard Louis – have now called to take to the street in support of the movement. Despite these late expressions of support, many on the Left continue to doubt this mobilization. 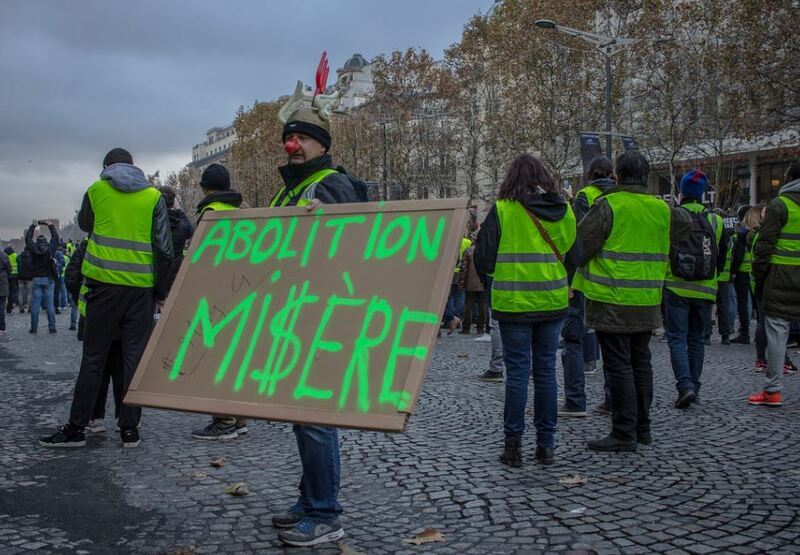 The movement’s self-proclaimed apolitical character, and the fact that many gilets jaunes claim to have never taken to the streets before, attracts accusations of “selfishness” or claims that the movement is “petty-bourgeois” in nature. Even those who call for the “convergence of the struggles” found it hard to support the demands of people who did not mobilize last year against the government’s triple offensive against railway workers, students, and migrants. Faced with these doubts, many activists have called for caution, to wait and see what will happen and what direction the movement will take. It is undoubtedly true that the roadblockers include all sorts: above all the “apolitical,” but also the fascists of the RN, supporters of the hard conservative right behind Laurent Wauquiez (Les Républicains), nationalists, Socialists, Insoumis, Communists, trade unionists, anarchists, and so on. But precisely for this reason, the wait-and-see attitude — “let’s see how it turns out” — risks delivering the movement to reactionary tendencies. Even the moralistic criticisms that accuse the gilets jaunes of materialism and selfishness can be called into question. Was not the increase in the price of bread the main factor pushing the women of Paris to mount their furious march on Versailles in October 1789? The history of social struggles is peppered with movements arising from an exasperation that owed to the material conditions of the popular classes, movements that can give rise to greater awareness, bring out wider demands, and which can converge with other struggles. Or not. The gilets jaunes’ situations are complex and multiform, but they express a real discomfort. For the political left to participate in the movement poses many difficulties, but it can at least try to intercept this discomfort, to give it useful slogans, and to prevent it from being recuperated by the far right. This will help the gilets jaunes develop into a movement concerning not only tax but also important ecological and redistributive demands. It is also true that for now the enormous visibility that the media have given the gilets jaunes has eclipsed other important movements also taking place in France at the moment. The most striking example is the events organized on Saturday 24 for the international day against violence against women. For months, collectives and feminist associations have been set up to organize a “tide” against sexist and sexual violence. One year on from #MeToo, which had real resonance in France, Nous Toutes sought to create a unitary and mass movement, in a country where the feminist movement has been marked by tensions and sharp divisions. This was, indeed, a success: on Saturday more than fifty thousand people took to the streets throughout France, including thirty thousand in Paris. This was much less than Rome (where organizers claimed two hundred thousand participants) but a big increase on the two thousand that turned out in France last year. And the numbers who took to the streets against sexism were in any case much greater than the eight thousand gilets jaunes that marched on the Champs Elysées and then dominated headlines in subsequent days. The history of social struggles is peppered with movements arising from an exasperation that owed to the material conditions of the popular classes, movements that can give rise to greater awareness, bring out wider demands, and which can converge with other struggles. Or not. There are many other examples of mass struggles that have taken place in recent weeks in France, without getting the same media coverage as the gilets jaunes: teachers demonstrated on November 12 to defend schools from job cuts; from the Dordogne to Rouen, postal workers took strike action against the dismantling of the public postal service; on November 20, nurses mobilized for hospital funding. Although today we are seeing less a convergence of struggles than a multiplication of different ones, there are signs that this situation could evolve into a real converging of the peripheral France, the France of the cities and the banlieues, and the rest of the French activist left. On Tuesday, November 27 Macron made a series of announcements on the ecological transition, without making concessions to the movement. This Friday, a delegation of gilets jaunes should meet with the French prime minister Edouard Philippe. In the meantime, the state has been breaking up the roadblocks and arresting hundreds of people: some have already been sentenced to jail time. On Saturday night a tweet from Macron confirmed his support for the police and declared: “Shame on those who tried to intimidate elected officials. There is no place for violence in the Republic.” As usual, mainstream media have largely served the government’s strategy, focusing attention on violence to discredit the movement. But there is something more subtle and more Machiavellian — and certainly more dangerous — in Macron’s own strategy. In the government’s (and the media’s) attempt to paint the gilets jaunes movement as a reactionary movement directed by the far right, there is a maneuver to rally support behind his La République en Marche, and thus prepare the ground for the European elections. This maneuver already began some months ago, and is also connected to the police raids on the offices of La France Insoumise, the main opposition force on the left. In September, after a spring of mobilizations, but especially after the “Benalla affair” (the revelation of videos in which the president’s bodyguard, disguised as a police officer, beat protesters) Macron crashed into the polls. The France Insoumise leader Jean-Luc Mélenchon, conversely, reached his peak support, becoming the main opposition leader. In October, the government hit further crisis with the resignations of the environment minister, the Green Nicolas Hulot — who quit denouncing the lobbyists’ influence on government policy — and of Interior Minister Gérard Collomb. This was the context in which police raids were ordered on fifteen LFI and connected properties. This was an operation of unprecedented breadth in French political history, especially if we consider that it was just part of a preliminary investigation into LFI’s electoral expenses. Macron thus opened his campaign for the European elections of May 2019, which aims to present his party as the only “progressive” force standing against the various “nationalisms,” thus pairing the Rassemblement National and France Insoumise in the same “populist” basket. In 2017, Macron was elected mainly thanks to the vote against Le Pen — as had already happened in 2002 when Jacques Chirac won the election against her facther Jean-Marie Le Pen, with the important difference that while Chirac had won with 82 percent of the votes, Macron took 66 percent. Macron’s strategy is to recreate the same polarized scenario for the European elections. For this reason he has presented himself as the “anti-Salvini” and the “anti-Orban.” Yet Macron’s migration policy, as enacted with last year’s Asylum and Immigration Law, is perfectly compatible with that of Salvini or Trump: for example, its measures permitting the detention of children and the lengthening of administrative detention. The identitarian and xenophobic populism today flourishing throughout Europe is not a reaction or alternative to neoliberal policies, but its extension. As recently pointed out by Quinn Slobodian, exponents of Alternative für Deutschland and the Austrian far right have close ties with the famous Mont Pellerin Society, the global intellectual hub of neoliberalism. The flat tax promoted by Italy’s Salvini-Di Maio government is another example of the connivance between the ideas of the (center-left and center-right) neoliberal bloc and those of the identitarian right. Their common aim is to allow capital to circulate and to block the road to human beings. The Europe desired by Salvini and Orban is an identitarian extension of neoliberal Europe, not its opposite. On the horizon for May 2019’s European elections is thus a blue-brown continent. Le Pen’s party is ahead in current polling for next year’s vote, ahead of Macron’s party, Les Républicains, and France Insoumise. Indeed, over recent days the main media have been whipping up the specter of extremism, as they repeat that Le Pen’s party, presented as the country’s main opposition force, is working behind the scenes to set the gilets jaunes along a violent path. But there are also forces on the Left determined to shape the movement and prevent Macron or Le Pen exploiting it for their own ends. These activists, too, will be on the Avenue des Champs Elysées next Saturday, alongside and with the yellow-vested protestors. Aurélie Dianara is a research associate in international economic history at the University of Glasgow and a feminist activist who sits on the national committee of Potere al Popolo, Italy.